B Active has been working closely with the Open Polytechnic (below) from 2008 to current and provides a circuit workplace program once per week. This program has been consistently monitored over the years and quite a few of the staff who started with us in 2008 are still attending the classes. As the attendance is so regular, the emphasis has always been on progressions and making sure the members are getting challenged and improving each time. B Active is also the main fitness assessment provider for Dulux Seaview. 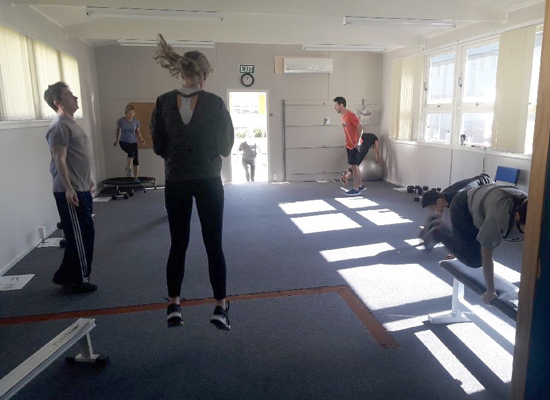 This company has a fully equipped gym for the staff to use, but as part of their health and safety regulations they must get assessed by one of our trainers prior to obtaining gym access. A basic medical check including a blood pressure reading is done onsite to make sure the member is medically able to embark on an exercise program. A training program is then designed and demonstrated with the member on site with a B Active trainer and the final draft is sent out to the member post assessment, for them to carry on with it on their own. If your company has a gym that your staff uses, we are also able to come to your work place and provide an on-site Personal Training service with very competitive rates. If your company has space for a gym suite but no equipment, we may also be able to provide some equipment specific to your teams needs and set it up for their use; we can also perform assessments and or Personal Training as well if required. We are very adaptable and can sit down with you and discuss your team's specific needs, abilities and fitness levels and design a program to suit.